What the World Was Watching: WWF Superstars – January 7, 1995 – Scotts Blog of Doom! –Stephanie Wiand, a low ranking Hollywood actress that the WWF picked up in 1994, hypes the upcoming Meadowlands and Madison Square Garden cards as part of the Holiday Wish Tour. The criticism of Backlund’s style not gelling with the current product is on display in this squash as he forces Knight to wrestle like an amateur and you can tell Knight is not comfortable with or used to do doing that. And a jobber named Bobby Knight? Was Vince angry at the current Indiana basketball coach around this time? It does not take long for Backlund to lock in his finisher and win, thereby keeping people aware of him as he had rematches with Diesel for the WWF title on the house show circuit. –Todd Pettengill provides the Royal Rumble Report. Bret Hart lets us know that WWF Champion Diesel is a “jam up guy” for giving him a title shot and Diesel plays “word association” in his promo that comes off as really juvenile and awkward. I am not sure what Vince was thinking as he had Diesel do this promo but it would have looked worse in a face-to-face showdown on RAW. Segments like this did Diesel few favors as champion and it is not surprising that veteran fans were turning on him by WrestleMania. New names added to the Rumble include Crush, who is making his return to the company, Mantaur, Jim Neidhart, and Owen Hart. Mabel, part of the tag team Men on a Mission, makes short work of classic jobber Mike Sharpe in this bout, hitting a few power moves before squashing him like a bug. This puts over Mabel as a threat to win the Royal Rumble because of his girth. –Shawn Michaels hosts his “Heartbreak Hotel” segment, with King Kong Bundy and Ted DiBiase featured as this week’s guests. They are still pushing Bundy as the “odds on favorite” to win the Royal Rumble, something that may have been entertained for a while until Diesel and Bundy put on some less than stellar bouts on the house show circuit in late 1994. Michaels objects to Bundy being considered the favorite and Bob Backlund and the British Bulldog each come out to make their case before Michaels abruptly ends the interviews. The WWF was doing a “fan gets to do ring announcing duties” promotion for a good portion of 1995 and the young girl they get to do it does pretty well, although she seems to have a crush on the Bulldog based on how she looks at him after he wins the match. Khoury was a mainstay on the eastern independent circuit in the 1990s, doing some enhancement matches while working for the East Coast Wrestling Association (ECWA) and the Mid-Eastern Wrestling Federation. The Bulldog wins and McMahon notes that he will face King Kong Bundy on the Action Zone. Fans are visibly laughing at the gimmick when Kevin Dunn puts their respective mugs on television, with a few completely flabbergasted that the company wants them to buy into this. Mantaur would eventually get some face paint but he just looks like a generic big guy in an ugly brown singlet, with Halac randomly making a mooing sound. 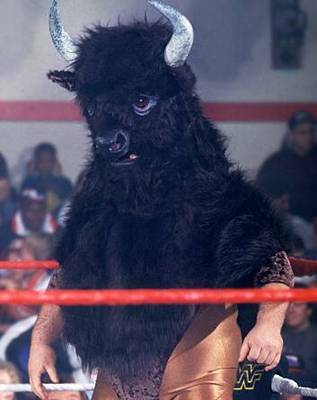 According to reports at the time, McMahon was disappointed in Halac’s portrayal of the gimmick and even prior to this debut he was losing to Duke “the Dumpster” Droese at house shows. The best part of the whole match is a female fan giving a disgusted look as if she will be much dumber after having sat through this display after Mantaur picks up his first victory. –Wiand hypes next week’s house shows as she did earlier in the broadcast. –McMahon and Lawler rewatch the botched ending to the tag team tournament match earlier in the show. –Tune in next week to see semi-final action in the WWF Tag Team Championship Tournament as Bam Bam Bigelow & Tatanka square off against the Headshrinkers and the 1-2-3 Kid and Bob “Spark Plugg” Holly face the Heavenly Bodies. Also, WWF Champion Diesel will be here for an interview! The Final Report Card: This was a “big man’s show” as the underlying message was that big men such as Mabel, King Kong Bundy, and Mantaur would have a better chance of winning the Royal Rumble. Shawn Michaels is flying under the radar on all three shows (Challenge, RAW, and Superstars) thus far but aside from the British Bulldog and Lex Luger he has the best singles reputation going into the show. Up Next (for Tuesday): The Action Zone from January 8, 1995!